Drink uP | what's the pH? I’m very fortunate to have an incredibly scenic commute to work. Every day I walk up Washington Street, from Christopher to 14th (where I work) and back again, and marvel at how many great bars and restaurants are along this 10-block west side street. As a matter of fact, you can do your own little “pub crawl” without ever stepping off Washington Street. Cross the street and you’ll find The Standard Grill (848 Washington Street) and their outdoor Biergarten, serving up beer, German-style snacks and boozed up chicks in 5″ heels. Get there early because it gets packed and it gets loud. If the scene at the Standard isn’t for you, cross back over Washington and grab some thai food at SEA (835 Washington Street). 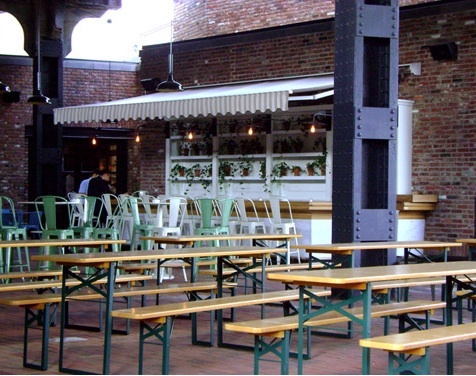 There’s outside seating with a great view of the High Line and the drunken hooligans at the Biergarten. Food is served here. Really. In the mood for diner food, or doing an AM walk down Washington? 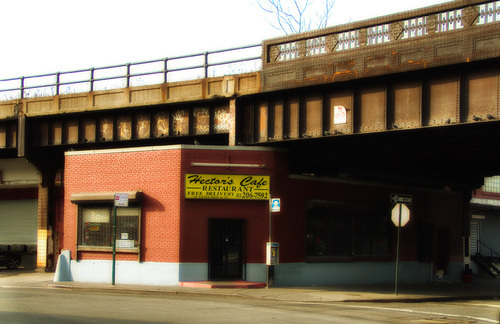 Grab a breakfast wrap at Hector’s Café (Corner of Little West 12th & Washington Street). It looks like the shadiest diner in the world but it’s inexpensive and delicious. I recommend the Florentine wrap. If you’re in the mood for something a little more upscale and Italian, Barbuto (775 Washington Street) is a fabulous place with great ambiance. 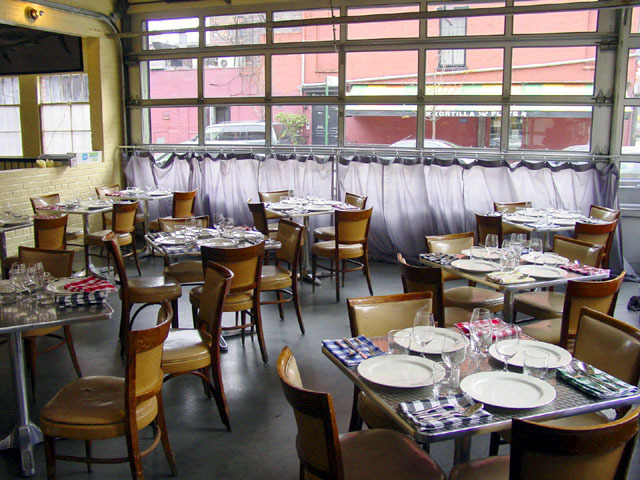 With outdoor seating, daily menus and brunch on the weekends, you can’t go wrong here. Barbuto. But look out the window: it's Tortilla Flats! Now if it’s cheap, not really authentic but still delicious Mexican you’re craving, you’re in luck! Everyone’s favorite west side drunkery, Tortilla Flats (767 Washington Street) is just across West 12th Street. If you’re not in the mood to have your memory erased by a barrage of tequila and bingo, not a problem. There’s a new wine bar next door called Entwine (765 Washington Street) that has an outside garden, wine tasting downstairs and a more loungey, sophisticated vibe. On the corner of Bank and Washington Streets you’ll find the best happy hour deal on the west side at Automatic Slim’s (733 Washington Street): $3 draft beer, $4 wine. It can get crowded and loud here but there’s always good music and funny bartenders. Oh, and cheap booze. 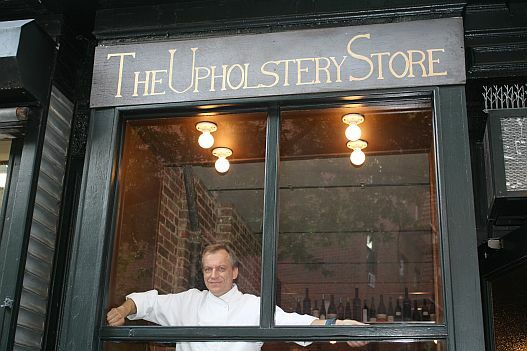 Continue your trek to The Upholstery Store (713 Washington Street), one of my absolute favorite places in the city to get wine and a snack. From the outside it appears to be a home furnishings store (hence the name) but what’s inside is an intimate space filled with friendly bartendresses, overpriced pretzels and a lovely wine selection. Last but not least, before hopping onto the PATH train back to the Jerz, we stumble upon Malatesta Vino & Cucina (649 Washington Street), a terrific little Italian restaurant on the corner of Washington and Christopher Streets. There’s plenty to see on Christopher Street so this is perfect even if you just want to sit outside, have a carafe of Chianti and take in the sights. Happy west side eating and drinking! Back in the day my girl Jen Smith and I would debit-card a humongous bottle of $9.99 Citra Merlot from the liquor store across the street from us on Graham Ave in Brooklyn and not even think twice about how embarrassing it was. We’d pair it with a loaf of Italian bread from the Mafioso bakery, olive oil and hours of good music (cds, not iPods) and, in the words of my Irish grandmother, be happier than pigs in shite. In the past five years I’ve been fortunate enough to travel to France twice, Spain and Greece and have sampled beautiful wines in all price ranges but I refuse to become a wine snob. 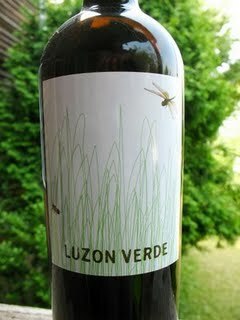 This in turn has kept my mind open to the little treats in life such as Luzon Verde, a $9 100% organic red wine from Spain that I can’t stop drinking. Dark purple in color, this Monastrell is best chilled for 10 minutes and poured into a decanter as it opens up wonderfully. I’m sure it’s delicious with food but we love to drink it by itself. The flavors are violet, licorice and berries, rich and full on the palate without the choking of the throat that tends to happen with many Spanish reds. I’m not a wine writer or expert by any stretch but I am an enthusiast and I assure you that I’ve come a long way from the crappy wine days back in Billyburg…and this one’s a winner.